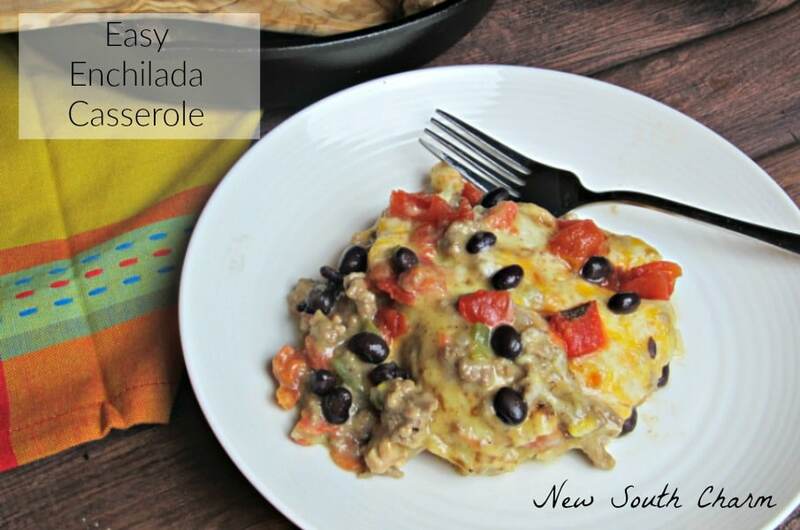 Easy Enchilada Casserole is a great way to enjoy all the Mexican flavor of traditional Enchiladas with less work and less mess. 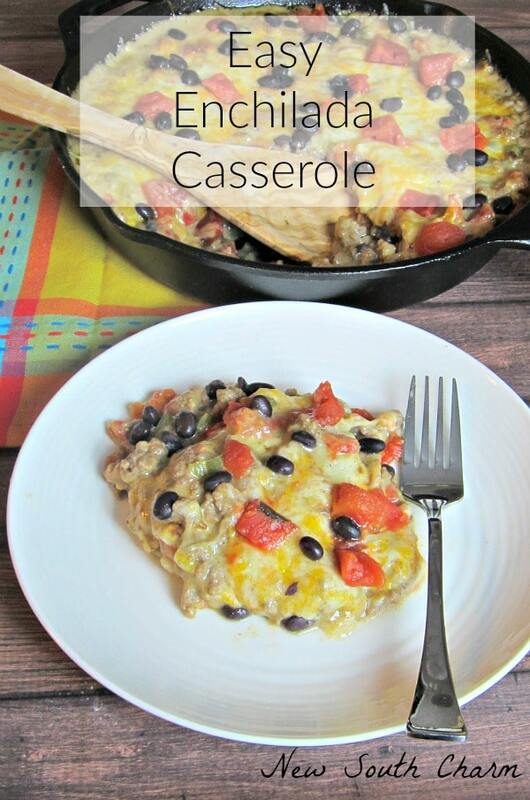 This casserole is easy to make and will be one that your family will ask for again and again. I’ve been on a bit of a Mexican food kick lately. Last week I made Taco Casserole, and then earlier this week I made quesadillas and just last night we went out for Mexican food. Then today I decided that this casserole was a great idea for dinner even though I’d planned to make something else. 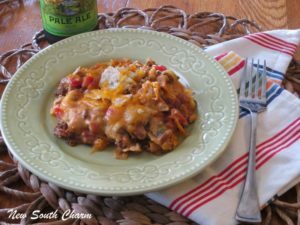 This is a small recipe so if you are feeding more than six people or you like to have seconds you’ll want to double the recipe. To line the skillet with tortillas. You’ll need to cut them in half and turn them so the round sides are facing the middle. It should take four halves or two whole (before cutting) to cover fill the space. I sometimes have a little hole that’s not covered by the tortillas. When this happens I just tear enough off of an extra tortilla to cover it. The beef mixture for this dish is actually separate parts of two different recipes that I combined to make this recipe. I actually do this a lot. I also take the basic ingredients of a recipe we love and make changes, like chicken for beef or rice for pasta, it to create a whole new recipe. A lot of the recipes I share with you here are recipes that I’ve tweaked. The biggest change I’ve made to this recipe is the sauce. 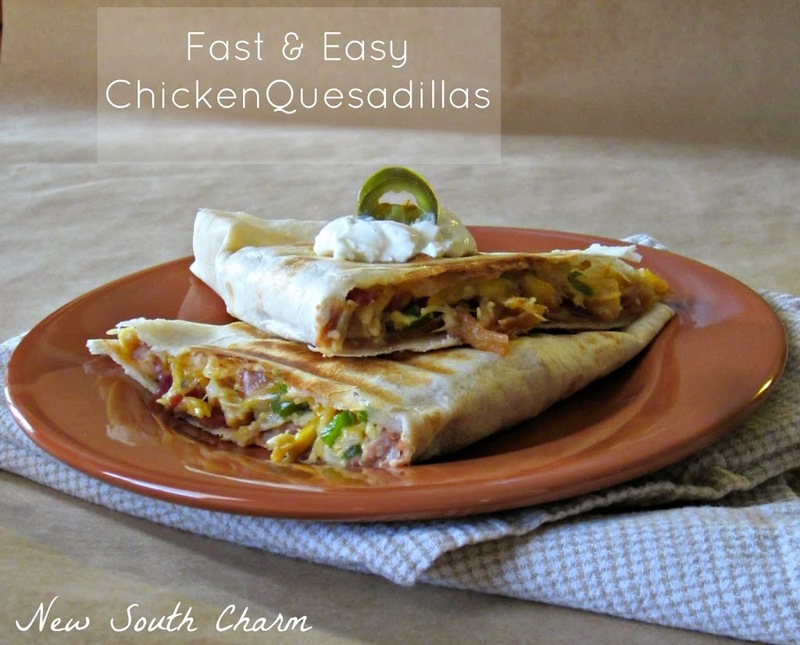 Here I’ve swapped out Red Enchilada Sauce to a Green Chili Enchilada Sauce. I think The Chili Sauce is lighter and the flavor is not as over powering as the Red Sauce. 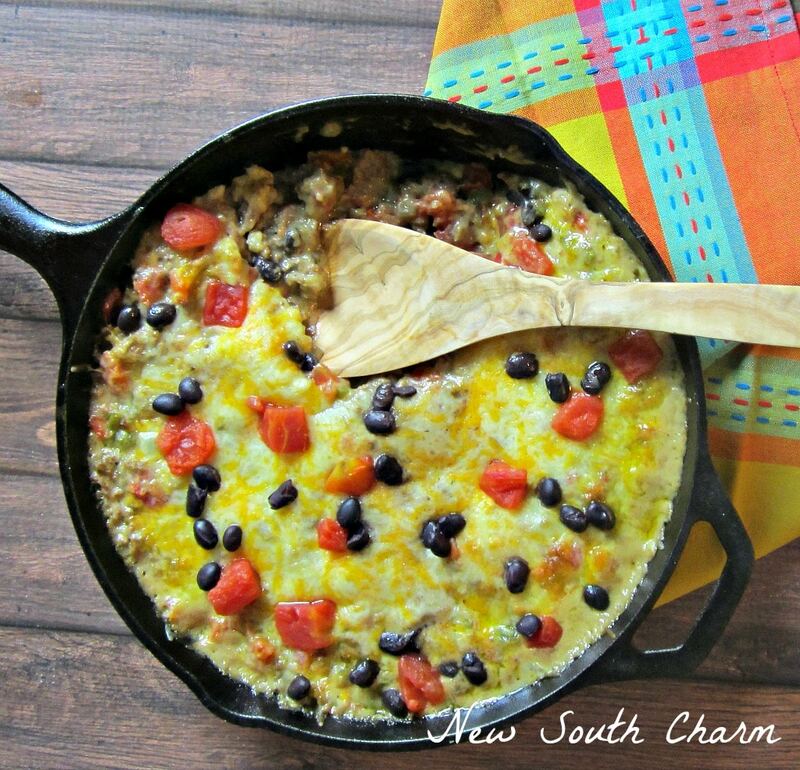 I also added Black Beans to the recipe. This just a spur of the moment decision that was made when I realized I had a can of Black Beans in the pantry. We liked the addition of the beans so much I’ve just been adding them in every time. This recipe is one of our favorites. We enjoy it all year long but the comforting warm flavors make it perfect for cooler months. 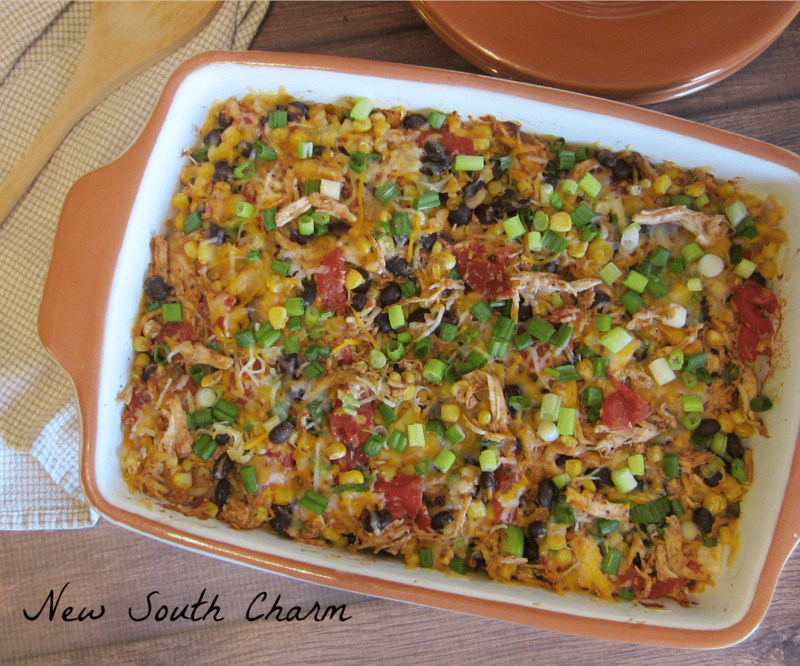 If you like Mexican food you’ll love this Easy Enchilada Casserole. Melt butter and cook onions, and bell pepper until tender (about two minutes) in a large skillet on medium high heat. Once the beef is browned add a can of undiluted cream of chicken soup, Ro-Tel, enchilada sauce and 1/2 cup of cheddar cheese. Stirring over medium heat until all the cheese is melted and the mixture is well blended. 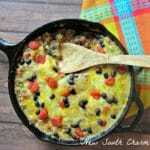 Line the bottom of a small casserole dish or oven safe skillet with six inch tortillas sliced in half. Pour half of beef mixture on top of tortillas. Repeat. Top with remainder of cheese. Place in preheated oven for 30 minutes, or until cheese is melty and bubbly. Your Enchilada Casserole looks fabulous! Your recipe is awesome, I have pinned it. We really enjoy you sharing with Full Plate Thursday and hope to see you again soon! Thanks Miz Helen! We just love Mexican food so much that I’m always looking for ways to make it! I hope you like this recipe as much as we do.